The idea of a hill resort located near Kuala Lumpur occurred to Tan Sri Lim Goh Tong during a business trip to the Cameron Highlands in 1964. He mooted this idea while enjoying the fresh and crisp air from the balcony of his hotel room. A private company called Genting Highlands Berhad was set up on 27 April 1965, with the late Tan Sri Haji Mohammed Noah bin Omar, Tan Sri Lim successfully obtained approval for the alienation of 12,000 acres (4,900 ha) and 2,800 acres (1,100 ha) of land from the Pahang and Selangor State Government respectively between the years 1965 and 1970. An anomaly happened during the obtaining of the land approvals. While the Pahang state government swiftly approved a freehold lease, the Selangor state reluctantly approved a 99-year lease. As a result, Tan Sri Lim Goh Tong met the then Menteri Besar of Selangor, Dato Harun Idris and told him that a freehold lease would be more feasible than a 99-year lease. Finally, the Selangor state government agreed to grant a freehold lease. On 18 August 1965, a technical and construction team began the four-year task to complete the access road from Genting Sempah to the peak of Gunung Ulu Kali. On 31 March 1969, the late YTM Tunku Abdul Rahman, Malaysia's first prime minister, laid the foundation stone for the company's pioneer hotel, marking the completion of the access road to Genting Highlands Resort. The Prime Minister was impressed that the private sector, without the assistance of the Government, could develop a mountain resort for the enjoyment of all Malaysians; subsequently a gaming licence was suggested to help accelerate the development of this remote area. 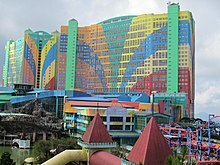 In 1971, the first hotel at Genting Highlands was successfully completed and was named Highlands Hotel (now renamed as Theme Park Hotel). The Genting Highlands Resort continued to expand since the opening of the first hotel in 1971. Development of the area continued with care taken to ensure the maintenance of the natural beauty of the rainforest of the region. In 1997, Genting Highlands Resort added the Genting Skyway cable car system that provides a 3.38 kilometres (2.10 mi) transport to the hilltop. Genting Skyway is also recognised as the "World's Fastest Mono Cable Car System" with a maximum speed of 21.6 kilometres per hour (13.4 mph) and the "Longest Cable Car in Malaysia and probably in Southeast Asia". In 2013, Genting Malaysia embarked on a master plan to reinvigorate and transform RWG under the Genting Integrated Tourism Plan (GITP). Genting Integrated Tourism Plan is a 10-year master plan for development, expansion, enhancement and refurbishment of hotels, theme parks and infrastructure at Resorts World Genting. The plan with different phases involves a new 1,300 rooms hotel expansion to the current First World Hotel, a new 10,000 seats arena and reconverting the Genting Outdoor Theme Park to 20th Century Fox World. Genting Highlands has a spring-like climate, with yearly temperatures no higher than 25 °C (77 °F) and rarely falling below 14 °C (57 °F) yearly. The lowest temperature of Genting Highlands is 8.4 °C (47.1 °F). Resort Hotel 1992 The hotel is a long white tower that faces the Theme Park Hotel and the main entrance to the 20th Century Fox World. One of the entry points to the huge Genting de Casino (the original one) is in this building. The First World Plaza was closed from June 2017 to February 2018 for refurbishment. Hence, the indoor theme park, which was located in the plaza, had been closed as well. SnowWorld, Genting Bowl and Video Games Park which are within the plaza have reopened in February 2018. On 8 December 2018, a preview event of the new indoor theme park, called the "Skytropolis Funland" was held. The VOID, a US-based operator of unique fully immersive virtual reality attraction officially opened their first centre in Asia on 6 December 2018. It spans nearly 7000 square feet in the Skytropolis Funland. Resorts World Genting is the only legal land-based casino in the country. There are two main casino outlets in the resort which are Genting Casino and SkyCasino. The resort has two performance venues and a cineplex. Arena of Stars is a concert hall with a capacity of 5,132 seats. Genting International Showroom is a hi-tech and multimedia entertainment venue with up to 1,000 seating capacity. Bona Cinemas at SkyAvenue is their first cineplex outside China and consists of 6 cinema halls equipped with Dolby Atmos sound systems and IMAX theatre systems. Compared to Cameron Highlands and Fraser's Hill, Genting Highlands is much easier to access from highly urbanised areas (i.e. Kuala Lumpur or even Kuantan), and is the only hill resort that is accessible by a modern tolled expressway, the East Coast Expressway (LPT) . Exit 803 to Genting Highlands is located at Genting Sempah at the Pahang-Selangor border just before the Genting Sempah tunnel. An 18-km mountain road will then connect the exit to the peak. For a toll-free alternative, there is the old Gombak-Bentong road that passes through Genting Sempah mountain pass. Alternately, there is another route, the Jalan Batang Kali-Genting Highlands which begins in Batang Kali in Hulu Selangor. This allows motorists from Perak, Penang or even Kedah to reach Genting Highlands without going through either downtown Kuala Lumpur or the LPT. As with most of western Pahang, Genting Highlands is not served by any rail line, given its mountainous terrain; the closest three stations arguably are KJ1 Gombak on the Kelana Jaya Line, Mentakab on the KTM Intercity Eastern Sector and KA12 Batang Kali on the KTM Komuter. Nevertheless, Resorts World Genting provides hourly shuttle buses from the Gombak LRT station, as well as SP8 AG8 SBK17 Pudu Sentral, KJ15 SBK15 KA01 MR1 KL Sentral and SBK9 Bandar Utama to Genting Highlands. On the state level, Genting Highlands falls under the Ketari constituency of the Pahang State Legislative Assembly, currently held by Young Syefura Othman of the DAP. ^ "RM5b to transform Resorts World Genting". thesundaily.my. 18 December 2013. Retrieved 19 March 2018. ^ "Resorts World Genting gains two accolades in the 2018 Forbes Travel Guide Star Ratings". businessinsider.com. 6 March 2018. Retrieved 19 March 2018. ^ "Crockfords Hotel awarded Malaysia's first 5-star Forbes Travel Guide rating". nst.com.my. 23 February 2019. Retrieved 17 March 2019. ^ "Twentieth Century Fox theme park announced". edition.cnn.com. 18 December 2013. Retrieved 19 March 2018. ^ "Disney, Fox sued in U.S. for $1 billion over Malaysia theme park". reuters.com. 27 November 2018. Retrieved 23 December 2018. ^ "Genting M'sia says outdoor theme park opening date still up in the air". theedgemarkets.com. 20 December 2018. Retrieved 23 December 2018. ^ "Asia's first hyper-reality experience centre opens in Genting". malaymail.com. 7 December 2018. Retrieved 23 December 2018. ^ "China's Bona Film Group opens first overseas cineplex in Malaysia". channelnewsasia.com. 25 February 2018. Retrieved 19 March 2018. Wikimedia Commons has media related to Genting Highlands. Wikivoyage has a travel guide for Genting Highlands.